Delfield 3978273 Coated Wire Shelf - 20 1/2" x 19 1/4"
Thanks to its innovative front-breathing design, the Delfield 4448N-12 sandwich / salad prep refrigerator can be pushed flush against a wall, or built into a cabinet or counter, to help conserve valuable space in your busy kitchen, deli, or pizzeria. The ingredient rail can hold up to (12) 1/6 size food pans (included), so you'll always have the toppings you need close at hand. Additionally, a 10" wide, antimicrobially treated polyethylene cutting board provides ample space to prepare delicious sandwiches, salads, and subs piled high with fresh meats, colorful toppings, and savory sauces. Two epoxy-coated wire shelves help you organize back-up and bulk ingredients in the prep refrigerator's lower cabinet. Featuring a stainless steel exterior sides, top, and front, this unit is designed for maximum durability. Plus, its ABS interior sides are corrosion-resistant and they won't dent, ensuring long-lasting use in your establishment. A set of 5" casters is included for easy mobility, making it easy to clean the floor underneath the unit. 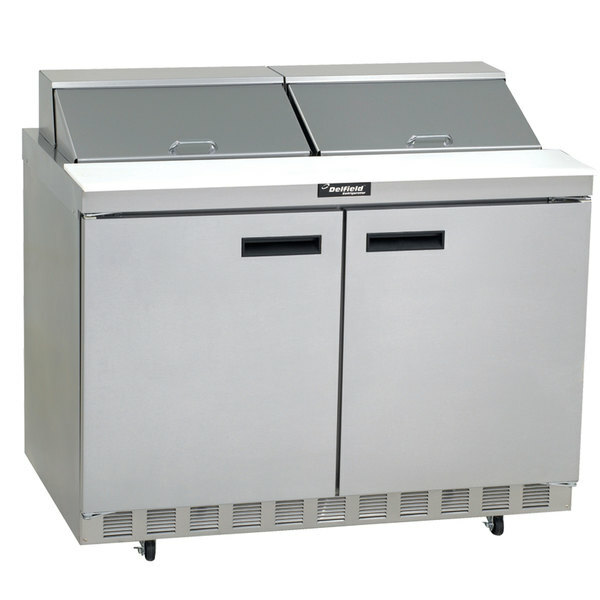 This sandwich / salad prep refrigerator is powered by a 1/5 hp compressor and maintains temperatures between 36 and 40 degrees Fahrenheit. It requires a 115V electrical connection.